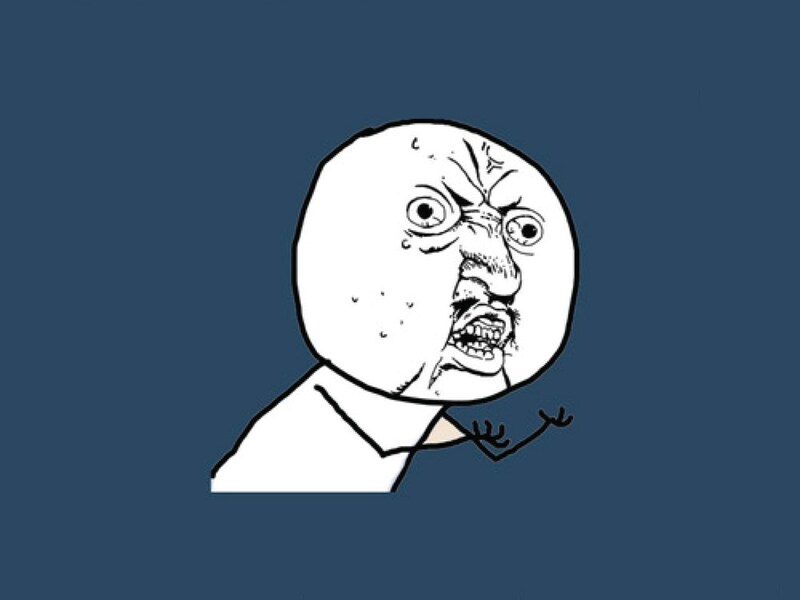 The Y U No meme actually began as Y U No Guy but eventually evolved into simply Y U No, the phrase being generally followed by some often ridiculous suggestion. Originally, the face of Y U No guy was taken from Japanese cartoon Gantz’ Chapter 55: Naked King, edited, and placed on a pink wallpaper. The text for the item reads “I TXT U … Y U NO TXTBAK? !” It appeared as a Tumblr file, garnering over 10,000 likes and reblogs. It went totally viral, and has morphed into hundreds of different forms with a similar theme. When it was uploaded to MemeGenerator in a format that was editable, it really took off. The formula used was : “(X, subject noun), [WH]Y [YO]U NO (Y, verb)?”. The Y U No figure stands with arms held out and fingers spread in a plaintive, almost begging gesture, looking pained that whoever the subject of his plea has not done something. Translated into regular English, the text would read “I Texted You, Why Have You Not Texted Me Back?” Some other notable examples of Y U No include: “PAYPAL: Y U NO ACCEPT WIKILEAKS DONATIONS?”, “CONGRESS: Y U NO COMPROMISE ON THE DEBT CEILING?”, AND NASA: Y U NO FIND REAL ALIEN?”. Often the chosen subjects are famous people or institutions, but there also exist more general subjects, often focused on lack of communication or the little problems that arise in life.